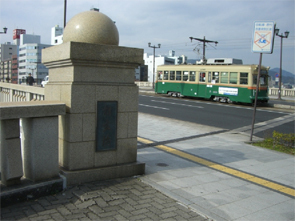 The bridge that had been built in 1932 as a bridge only for streetcars was extended in 1934 from its central section to Jisenji-no-hana (now the north end of Peace Memorial Park) and thus received its unique T-shape that was a rare sight in Japan. Besides, in the very south of the bridge there were two wooden bridges on the east and west that had been built in 1878 and in the short period until they were taken down, Aioi Bridge formed an H-shape and created a special scenery. The bridge is regarded to have been the target of the atomic bomb. The bomb missed slightly, exploding in the air over Shima Hospital located 300 meters away from the bridge. The fierce blast deformed the girders, the handrail on the northern side fell into the river and a part of the sidewalk was lifted up. The bridge was reconstructed after the war but gradually deteriorated and a new bridge replaced the old one in 1983. Granite stones were used in the reconstruction for the handrails and the main pillars in order to harmonize with the area around Peace Memorial Park and A-bomb Dome. Now old pillars bearing the marks of the bombing are still preserved at the foot of the bridge and some of the girders deformed by the blast are displayed in the Hiroshima Peace Memorial Museum.